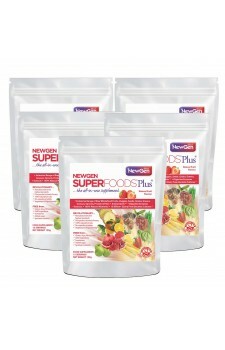 Our discounted family pack consists of 5 pouches of our revolutionary all-in-one food supplement, NewGen Superfoods Plus. This includes two pouches for both parents, which is a month's supply, plus one pouch for your kids. Children over 3 can use our product. Our enhanced revolutionary all-in-one food supplement contains an extensive range of raw wholefood certified organic fruits, veggies, seeds,grains, protein, fibre, grasses, greens, sprouts, plus antioxidants, minerals,35+ billion dairy-free friendly bacteria, fruit extracts and digestive enzymes. As featured extensively in the British press, NewGen Superfoods Plus is a cutting-edge food supplement, manufactured to the highest industry standards,replacing the need for many different products. It is 100% natural, with no synthetic nutrients. There are no capsules or tablets to consume, the powder is easy to mix with liquid or with food and it is vegetarian & vegan friendly. Our formula is free from gluten, soya, whey, dairy and GMO ingredients. NewGenDirect is very proud to be a certified organic company, inspected and certified by the Organic Food Federation. We use a wide range of certified organic ingredients in our product, including organic raw wholefood fruits, veggies, seeds, grains,greens, sprouts, grasses, fibre & protein. Our proprietary revolutionary all-in-one food supplement is made to the highest industry standards in our manufacturing partner’s state-of-the-art 1 million sqft certified organic manufacturing facilities. Manufacturing to the highest industry standards, our manufacturing partner’s facilities has the capability to perform over 1,000 different quality control, analytic and biophysical tests on raw ingredients.To name a few, the ingredients in our product are GMO free and tested for pesticides, radiation, heavy metals, dirt, microbes, botanical identification,adulteration, active ingredients, gluten and many more. We manufacture to cGMP (Good Manufacturing Practices) and GLP (Good Laboratory Practices) standards and in addition we are HACCP compliant (Hazard Analysis and Critical Control Point), FDA compliant (Food and Drug Administration), USDA compliant (The United States Department of Agriculture) and GMA Safe (Grocery Manufacturers Association). Our manufacturer has the highest British Retail Consortium (BRC) independent facility inspection rating, rated “A” for exceptional manufacturing standards and practices. In addition to our company, they are also organically inspected and certified. 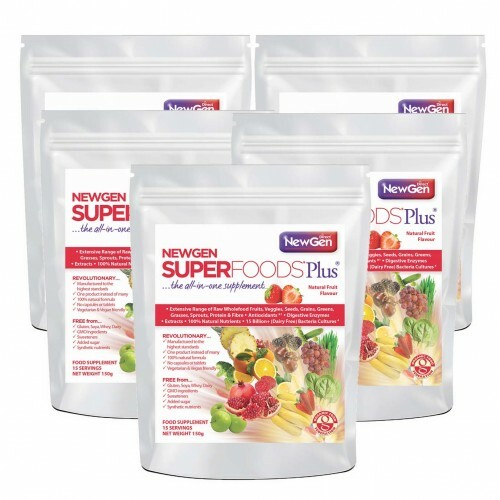 Our proprietary world-class formula, NewGen Superfoods* Plus®, replaces the need for many different types of supplements and is made with only the finest 100% natural ingredients. Organic Banana, Organic Brown Rice Protein, Organic Quinoa, Organic Strawberry, Organic Acerola Cherry, Extract Blend (Grape Seed Extract, Quercitin Extract, Resveratrol Extract, Wild Bilberry Extract, Humic Plant Extract), Bacteria Culture Blend (Lactobacillus acidophilus, Lactobacillus casei, Lactobacillus rhamnosus, Lactobacillus plantarum, Lactobacillus paracasei, Lactobacillus brevis, Lactobacillus bulgaricus, Streptococcus thermophilus), Organic Agave Inulin, Organic Pomegranate, Organic Apple, Digestive Enzyme Blend (Amylase, Cellulase, Lipase, Neutral Protease), Organic Acai Berry, Organic Beetroot, Organic Blackberry, Organic Blueberry, Organic Carrot, Organic Cherry, Organic Cranberry, Organic Goji Berry, Organic Grape, Organic Mango, Organic Orange, Organic Pineapple, Organic Raspberry, Organic Tomato, Organic Broccoli, Organic Lemon, Organic Spinach, Organic Wheat Grass, Organic Flaxseed, Organic Barley Grass, Organic Alfalfa Sprout, Organic Broccoli Sprout, Organic Kale Sprout, Organic Pea, Organic Quinoa Sprout. Sub Ingredients: Organic Maltodextrin, Organic Rice Flour, Silicon Dioxide, Organic Tapioca Starch, Organic Sunflower Oil, Sunflower Lecithin, FOS (Fructooligosaccharide). This superfood nutrient helps to maintain a healthy immune system function during & after intense exercise and a healthy function of the nervous system and psychological function. Vitamin C not only assists with normal collagen formation in the skin, bones and teeth, it also helps protect cells from oxidative damage and increases iron absorption. This superfood nutrient is a key trace mineral, which helps maintain healthy bones and formation of connective tissue, as well as protecting cells from oxidative stress (fatty acids). This superfood nutrient contributes to a healthy energy-yielding metabolism, synthesis & metabolism of steroid hormones, vitamin D & some neurotransmitters. Pantothenic acid along with vitamin C, also contributes to the reduction of tiredness & fatigue. As a Food supplement for adults, take 1 to 2 level scoops a day. As a rule of thumb, a child's serving is based on size and body weight. For example, a child half the size and weight of an adult can have half a serving (5g). Mix with 4 fl oz (118 ml) or more of water, juice, unsweetened rice/almond milk or mix into a smoothie. This is a premium, 100% natural product and we do not use any mixing carriers, so please use a shaker or bottle and shake vigorously or use a blender. Alternatively, mix with food, such as natural unsweetened yoghurt or porridge. Once mixed, please consume straight away. Do not exceed directions of use. Food supplements should not be used as a substitute for a balanced diet. As with all food supplements, you should speak to your healthcare practitioner before use if you are pregnant, nursing, or being treated for any medical condition. Should you have an adverse reaction to this product, please discontinue use and speak to your doctor. Unless under the guidance of a qualified health specialist, our product is not suitable for Children under 3 years of age. Once opened, please use within 30 days. Keep tightly sealed in a cool dry place, do not expose to any moisture, keep out of sight & reach of children.